Instagram is about sharing small, photo-sized stories. They can be about life, adventure, love, or anything else. But these stories are the same stories that become the basis for a great lifestyle or streetwear brand. That’s one of the reasons why it’s such a great way to promote and grow your apparel brand. Not only can you reach millions of people, but you can establish your brand values, voice, and tone. Want to get found by people looking for cool accounts to follow on Instagram? Use hashtags–lots of them. Find as many relevant hashtags in your niche(s) as possible. Include smaller community tags. 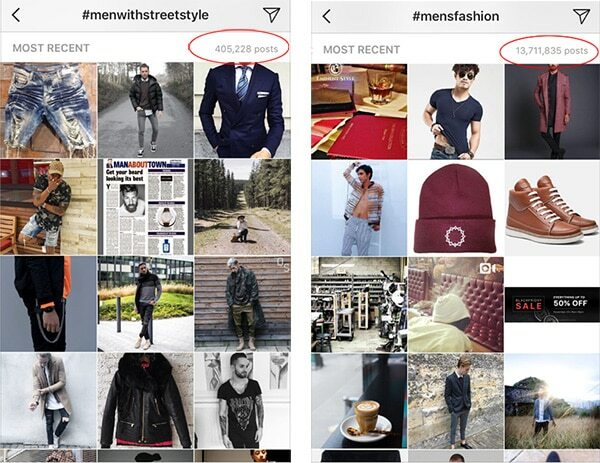 Don’t just use #streetwear, which is crowded with 13.5 million posts, but also consider #menwithstyle (2.5million) or #menwithstreetstyle (405k). Sometimes these smaller hashtag communities will have much higher engagement–from real people–than the big ones, which get filled with spam. You can identify these other hashtags by searching for obvious hashtags and then seeing the related tags across the top of the search. Or you can look at some of the popular posts within a certain search and scout their hashtags for ideas and inspiration. Store your list(s) of relevant hashtags (shoot for 10-30) into a note on your phone, an email, or text document. That way you can quickly and easily build these lists and then copy and paste them into your post when it’s time to go live. If you’re targeting different communities within Instagram, it might make sense to create a number of unique variations of hashtags for each audience. When you post, add the hashtags as a comment. They’ll still count the same to Instagram even if they aren’t in the initial post and this will make your post feel less cluttered/spammy. You can also use line breaks and other tricks to push the hashtags off down below the “more” tag and clean up your actual post. Lastly, create your own hashtags. Using existing tags can be great for expanding your reach and exposure, but having something branded or something that represents the life of your brand can be hugely valuable. You can use the hashtag in promotions, contests, and other engagements as your following grows. One of the best ways to rapidly grow your following is to find established, related accounts that will have followers who are interested in your brand and then “steal” their followers. As a streetwear brand, you’ll want to target competitors, related products/services/brands, and media like Hypebeast, which have an established follower base of people interested in the product and brand you’re promoting. Go through their followers and interact with them. 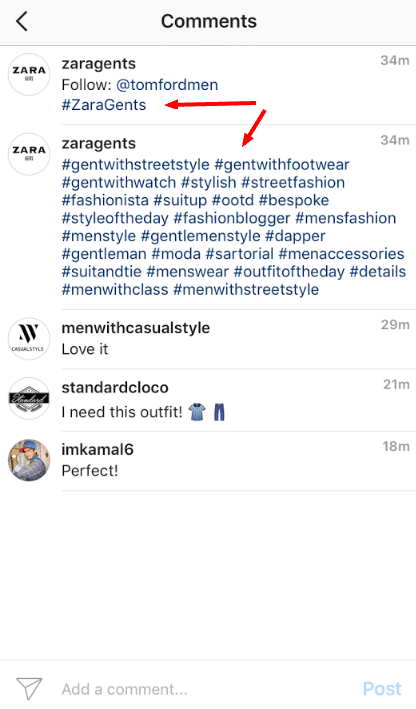 This may seem super simple, but you can quickly build a following by just interacting with people who may be interested in your brand and triggering a notification for them. This means going through the followers on these related accounts and following, liking, or commenting on photos. There have been some experiments done to see which model works best–generally speaking, the more effort you spend engaging each user (e.g., if you like three photos, follow, AND comment, versus just liking a single photo) the higher percentage of them that will follow you. But there are diminishing returns on the added effort. Experiment with different engagement tactics to see what works best. Make sure you have some interesting starter content on your profile before you start doing this–no one is going to follow you if your account is bare or you just look like spam. The currency of Instagram is engagement and visibility–and everyone is hungry for it. One way to grow your visibility and expand into new markets is to do a S4S (shout for shout or share for share) or other cross-promotion arrangement with another Instagram user. Connect with other IG users who have about the same number of followers as you and offer to create a partnership. This can take the form of sharing one another’s photo with proper credit (e.g., “Follow @xpartner for more awesome photos like this”) or any other promotion. This will give you some free extra exposure and it will only cost you a reciprocal shout out. Choose your targets wisely. You’ll want to be careful which accounts your associate with your brand and you’ll want to be sure that their audience is highly relevant and likely to be interested in your posts to get the most value. How am I supposed to know what you want me to do if you don’t ask? Give your followers a call to action or ask a question on each post to increase engagement. “Like if you’d rock this” or “Tag someone who would wear this out” work like a charm. Seriously–try it out. And you don’t need to be super serious about it. Feel free to get funny or creative and make people laugh. People love to play games–especially if there is something to win. Do special promotions, offers, and giveaways to boost your engagement and followers. You can ask your followers to tag a friend for a chance to win some free merch or to follow you for a chance to get a discount code. Prizes are nice, but the giveaway doesn’t need to be extravagant–most people just like to be recognized. You can also encourage your followers to share photos of themselves doing certain activities or wearing your apparel. Have them tag you and/or use a certain hashtag and then turn it into a crowdsourced campaign. More posts = more opportunity for engagement = more followers. The math of this one is simple. Try to post as often as possible (within reason, of course) to get the most visibility. Many of Instagram’s most popular users post 3, 5, or up to 10 times per day. You don’t necessarily need to oust them, but just keep in mind that the IG feed moves quickly and people check it at different times throughout the day. So posting frequently isn’t likely to turn off too many people unless it’s overly spammy or promotional. Have a great post that gets a bunch of engagement? Use it again. Don’t be afraid to recycle your content if it’s relevant and timely into the future. Things like product shots, quotes, and other lifestyle content can be reused or remixed into new pieces. Just be sure to give it a bit of time between sharing the same photo or you’ll probably see a big dip in engagement. As a general rule, once a particular post has been pushed down, off of the visible grid on your profile page, it’s probably safe to repost it. Not getting the results you’re looking for? There’s no shame in spending a bit to increase your reach. Use the Facebook/Instagram advertising platform to target specific people and communities and promote your content to them directly. Focus on generating engagement with your promoted post–drive a specific action (“Like”, “Tag”, etc) to generate further visibility and improve performance on your post. Keep in mind that you don’t have to spend a ton of dough to grow your audience this way. Facebook/IG advertising is pretty affordable and can be laser targeted to just the right groups. All 8 of these actionable ways to grow your brand through Instagram, of course, require great content. The nice thing is that you don’t have to be an expert photographer to take cool and interesting photos. As long as you follow these steps consistently and stay active, you’ll see your account continue to grow.